Classic Cedar is located in beautiful rural Metchosin just minutes from Downtown Victoria, British Columbia. The outdoor show room displays Classic Cedar’s complete furniture line and many of the popular garden structures in a stunning garden setting. 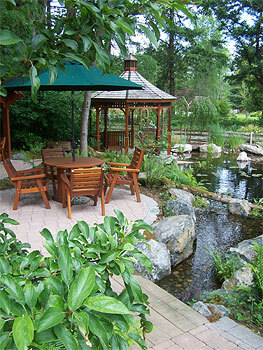 Come out and enjoy the furniture in its natural setting next to a gurgling brook. Swing in the Gazebo’s porch swing while overlooking the trout pond. Relax in a Chaise Lounge in the cool shade of the Tea House. Explore the garden structures set in a lush West Coast garden. Watch the kids feed the rainbow trout in the trout pond. Not your average show room? At Classic Cedar, we go out of our way to make sure that your outdoor furniture shopping experience is an enjoyable one so come and visit us soon! See our full catalogue of outdoor cedar products.